This week, I found myself in New York city, traveling to my company’s Mid-town Manhattan office near Times Square. Of course, this was just one week after the devastating Hurricane Sandy which tragically took lives and disrupted the lives of millions in New York, New Jersey, Connecticut along with other states up and down the Atlantic coast. And of course, outside of the US, the damage and devastation in Caribbean countries was equally dramatic. 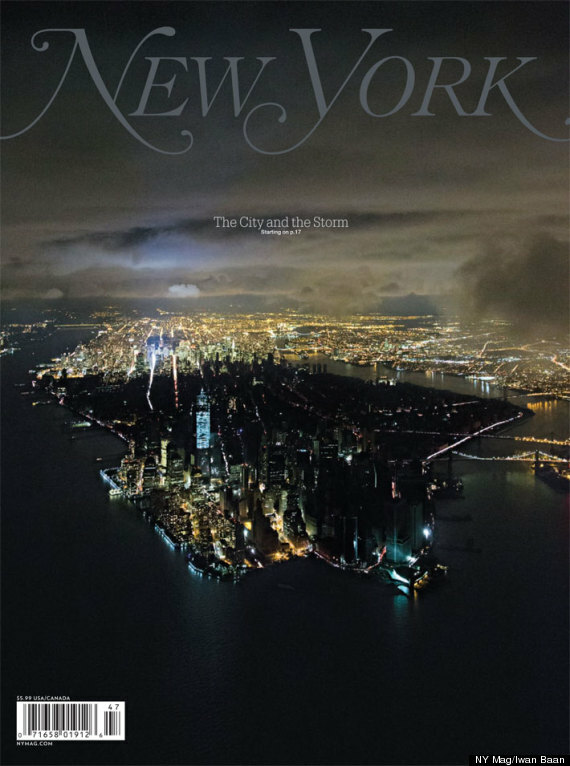 Of course, the cover photo from New York Magazine captured the reality of the city’s power distribution very powerfully. Last week, most businesses in Manhattan were closed—many of the offices didn’t have full power and employees didn’t have reliable transportation methods to get to the offices with subway and tunnel closures and a shortage of gasoline. And the offices that were open often had no expectations that employees would go to the office given the commuting challenges and if employees could work remotely, they certainly supported it. My basic observation of Manhattan this week compared to my several trips here in the past was that there were simply a lot fewer people walking along the streets to their jobs in Manhattan and fewer tourists around the Times Square area. But the people who were here were certainly talking about Sandy, and one particular sentence I overheard while walking on 7th Avenue really resonated with me. OH I had to go to work on Wednesday and Thursday to keep my phone charged. What makes this statement notable? In most cases, employees will always take the chance not to go to work if that option is presented. In this case, when power was disrupted at her home, this employee found that one of the primary reasons that she would go to work anyways and possibly endure long commuting times at a time when she was likely to be unproductive since other employees weren’t going to be there was to charge her smartphone. Her smartphone was essential to her ability to function day to day. Smartphones have become necessities in life for many middle class Americans. In a dire situation where many had day to day utilities such as power, gasoline, heat taken away from them, the smartphone and its place as at a minimum communication hub has become part of those obvious utilities. And beyond the communication hub, it may in fact be their entertainment hub, productivity hub, new hub and even more. Many people now no longer have landlines at home or the storm in this case may have cut her landline. I certainly understand that in this case, the direness for this particular citizen may have required that phone to always be charged to stay in touch with loved ones, doctors, police, electric company to keep her life in order, so by no means am I belittling her statement. But I do believe it is noteworthy that the smartphone has possibly emerged to be as essential in disaster times as other utilities such as power. During the aftermath of the hurricane, many people did in fact go without the smartphone and the entertainment, social networking, and life hub that it has become. This New York Times article talks about life without the smartphone during Sandy and in some cases, the realization of our extreme reliance on these devices. Some quotes from NY residents about their experiences illustrates our reliance on these devices, both for essentials to get through a disaster and its impact on day to day routine matters. “You had to make plans and stick to them,” Ms. Claxton said. “It felt so old-school, like we were back in 1998. An interesting alternative effect of the bliss of living in the offline world, not tied to a device, was also cited in the article. Amelia Erwitt, 32, and her husband, Kamil Kaluza, 36, who live in the West Village, said they enjoyed life offline — waking up with the sun, exploring their neighborhood, checking in on friends, cooking by flashlight and going to bed soon after sundown. They got their news from a battery-powered radio and checked e-mail by walking two blocks to a spot in front of a nearby deli that somehow offered a cellular connection. They would wave their phones in the air until they felt them buzzing with messages and alerts. But in my view, this is the exception and the reality will continue to be more and more reliance on devices for so many aspects of life: communication, entertainment, television, gaming, reading books, news. And let’s hope that more people don’t have to go through disasters like Sandy to realize otherwise. I guess it is a good idea to look into a solarpowered device to charge the smart phone! The smart phone is a very essential comm device for today’s lglobal life!